On December 4, 2018, the United States (U.S.) Secretary of State Mike Pompeo announced that U.S. will withdraw from the 1987 Intermediate-Range Nuclear Forces (INF) Treaty between Moscow and Washington if the former does not return to compliance within two months (60 days). He also announced that NATO allies in Brussels "strongly" supported U.S. accusations that Russia violated the terms of the treaty. "Russia's violation of the INF Treaty erodes the foundations of effective arms control and undermines Allied security. This is part of Russia's broader pattern of behavior that is intended to weaken the overall Euro-Atlantic security architecture", a joint statement issued after the North Atlantic Council in Foreign Ministers' session. Also, the joint statement clarified, "We continue to aspire to a constructive relationship with Russia when Russia's actions make that possible. As most recently confirmed at the Brussels Summit, we remain open to dialogue with Russia, including in the NATO-Russia Council. We call on Russia to return urgently to full and verifiable compliance. It is now up to Russia to preserve the INF Treaty". 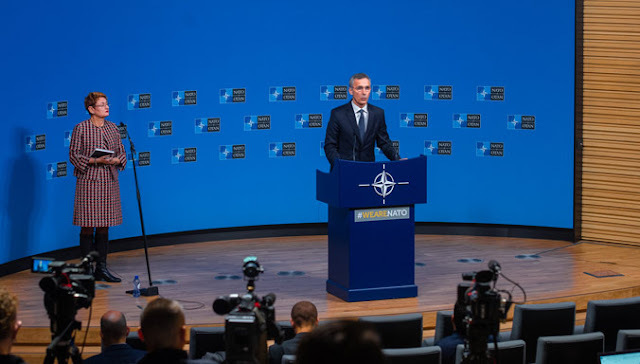 During a press conference following the meeting of the North Atlantic Council in Foreign Ministers' session, NATO Secretary-General Jens Stoltenberg said, "Russia knows our position, they know our concern, and in the beginning, they denied the existence of this system. Then actually they were not able to deny the existence of the system, but then suddenly they changed explanation and said, "Yes, the system exists, but it doesn’t violate the INF Treaty". But we are ready of course to talk to Russia; we did that in the NATO-Russia Council, we are ready to do it again. But I think this is actually not so much a question of how many meetings we will have with Russia because they very well know our position; this is about whether Russia wants to preserve the INF Treaty. If they so want, they can comply with the Treaty; if not, then this Treaty will not survive"
The INF Treaty prohibits the U.S. and Russia from possessing, producing, or deploying nuclear and conventional missiles, as well as their launchers, with ranges of 310–620 mi (500–1,000 kilometers) (short-range) and 620–3,420 mi ( (1,000–5,500 km) (intermediate-range). The treaty was signed in Washington, D.C. by President Ronald Reagan and General Secretary Mikhail Gorbachev on December 8, 1987, and was ratified by the U.S Senate on May 27, 1988, and came into force on June 1, 1988. "During this 60 days we will still not test or produce or deploy any systems, and we'll see what happens during this 60-day period," the secretary of state said. "We've talked to the Russians a great deal, and we're hopeful they'll change course, but there's been no indication to date that they have any intention of doing so". Pompeo said Russia had developed "multiple battalions" of the SSC-8 (also known as Novator 9M729 cruise missile), adding that its range "makes it a direct menace to Europe". It was originally designated in U.S. reports as the SSC-X-8, but officials removed the “X” when it transitioned from an experimental to the operational weapon. The SSC-8 (9M729) is by some accounts a variant of the SSC-7 (9M728) missiles, and its improved version - an extended-range missile - a new ground-launched missile system "Garnet". The SSC-8 (9M729) is a long-range ground-based cruise missile system. According to experts, it can be launched through Iskander-M TEL (9P78-1) mobile launch platform, which, if true, all such launchers has to be eliminated under the INF Treaty.